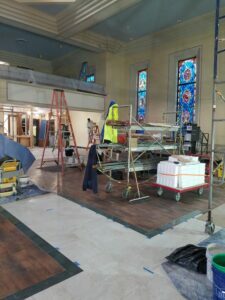 Current Project: St. Patrick’s Catholic Church in St. Charles, IL. Church History Information: In May of 1909, Father Robert J. Carse (1909-1950) began his 41-year pastorate of the parish in St. Charles. Father Carse began the construction of the present church in 1911 and it was completed in 1912. On June 16, 1912, Bishop Peter J. Muldoon dedicated the new church. The rectory was also built at this time. 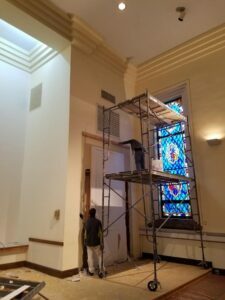 Work Progress: Daprato Rigali is currently performing a large renovation for St. Patrick’s Church in St. Charles. 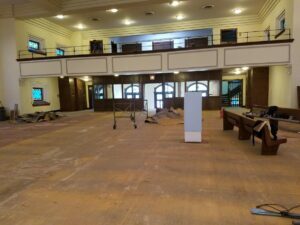 Some of the work includes: demo and removal of old wooden confessionals and other sanctuary items, stained glass windows restoration, new flooring, marble altar, tab tower, ambo, chair, and Baptismal font, installation of new narthex wall, new pews, new kneelers, and a new sound system. The treated underlayment for the flooring that will soon cover. Removing an old stained glass window panel that will be returned to our studio and then restored. 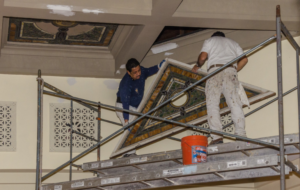 Daprato Rigali artists beginning the implementation of the new decorative paint scheme.